When I was a little kid I used to think Mazz’s Baseball Cards was the greatest place on Earth. This small card shop just about a mile from my house had all the collectibles one could hope for. I was likely too young to realize it then, but this place was dangerous for me. Mazz’s closed early in my life, and that’s absolutely for the better. Every time I’ve gotten back into sports cards over the past decade or so I’ve thought about the crazy amounts of money I would spend at that store should it have still been operating close to home. It’s likely for the best that it’s now a Chinese restaurant. Most people I know had some interest in sports cards as a kid. Well, that is to say most males I know. It seems like everyone had that phase. But what’s interesting now is how the hobby has evolved to an insane degree. The days of opening a pack of cards just to get the pictures of your favorite athlete are long gone. No, now packs of trading cards are loaded with pieces of memorabilia and autographs that command huge prices from collectors. And your mom said they wouldn’t be worth anything. For example, Panini America, my personal favorite trading card company as of late, produced the below video detailing how they made some of the special cards for a recent high-end product. 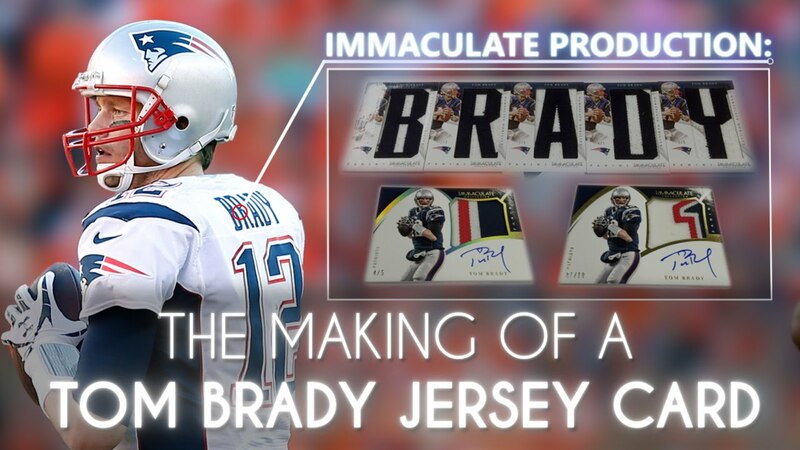 If you bought a pack of these cards (for roughly $350) you’d have a chance to win one of the letters from Tom Brady’s jersey worn in the 2013 AFC Championship game. But that’s just the tip of the ice berg. As fascinating as that is to see be created, it’s only a piece of picture. I’ve been lucky enough to open up packs of cards and get autographs from some big name stars – Clayton Kershaw, Matt Harvey, Matt Stafford, Chris Paul, Jahlil Okafor, and many more – but even I have some limits. Most being financial, obviously, as being a college student doesn’t give me a giant bankroll to play around with. That’s where YouTube comes to help. One of the most addictive things to do in the world is watch boxes of cards being opened online. You get to enjoy the mystery that comes with opening up high-end, very expensive boxes, without watching your bank account fall like a meteor. The more expensive the box, the better the watch. Here, just for funsies, is a video of a “case” of boxes. That means that sport card shops get these cases, and then sell the boxes one by one. A case can set you back thousands to buy normally. The four boxes opened here cost $750… each. That means this is about $7000-$8000 worth of cards. Again, this is why watching them is better than buying. As you can see, trading cards have moved on from the cute little hobby to a full blown madness. And it’s majestic. It might get expensive, and be a little daunting – so many possibilities – it’s at least fun to take a look online at what’s out there. This isn’t just for kids anymore.